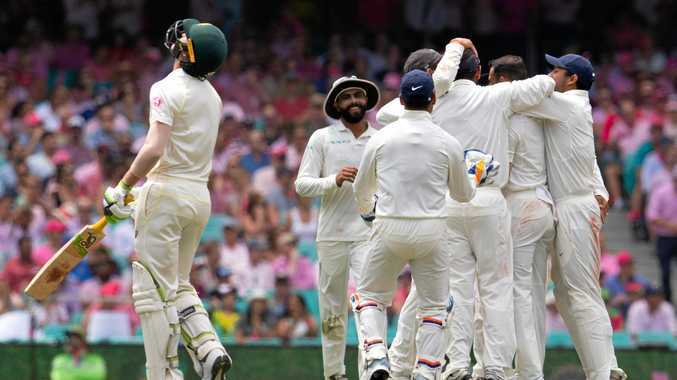 AUSTRALIA'S top order crumbled in a collapse of 3-24 after a positive start to day three of the fourth Test against India at the SCG, where bad light stopped play and stumps was called with the hosts in deep trouble at 6-236. The tourists, holding a 386-run lead, will likely have the option of enforcing the follow-on. Virat Kohli may wish to give his fast bowlers a break after the temperature hit 37.8 degrees in Sydney on Saturday. Regardless of Kohli's decision, India are perfectly placed to complete an emphatic maiden series win in Australia after their day-two declaration at 7-622. Peter Handscomb, unbeaten on 28, has an ideal pitch on which to prove he belongs at Test level and looms as Australia's best hope of finally celebrating a century this series. Pat Cummins is 25 not out, extending the career-best form with the bat he showed in Melbourne. However, once again Cummins found himself batting far too early in the innings after a stack of teammates got in, then got out. Travis Head, who looked set on 20 before throwing his wicket away, inexplicably chipping a full toss back to Kuldeep Yadav in the penultimate over of Saturday's second session. "That's another very soft dismissal," Ricky Ponting lamented on Seven. "You're never going to get better batting conditions ... it's just mistakes from batsmen." Marcus Harris and Marnus Labuschagne shared a 56-run stand, surviving a testing examination from Jasprit Bumrah and Mohammed Shami to reach lunch then march their side to 1-128. Harris' chop-on dismissal on 79, the highest score by an Australian since Usman Khawaja's knock of 141 in Dubai in October, shifted momentum. Left-arm spinner Ravindra Jadeja removed Harris and Shaun Marsh, with the latter hitting two cover-driven boundaries before offering Ajinkya Rahane a regulation catch at slip. Rahane plucked a far more remarkable catch to dismiss Labuschagne, who flicked the ball off his pads with beautiful timing but terrible placement. Labuschagne scored 38, showing promise but ultimately failing to cash in after his contentious call-up. Australia haven't played a four-Test series at home where they've failed to register at least one century. There were no Australian centuries in 1882-83, England's first Ashes tour, but the final match in that four-Test series was an exhibition fixture.